Review of the ASUS TUF Gaming K7 Optical-Mech IP56 Gaming Keyboard. We get a lot of impressive mechanical keyboards through the eTeknix office. However, short of a few macro buttons and some slightly different RGB, they're all pretty much the same. Take the ASUS RoG STRIX Scope RGB we reviewed last week, it's phenomenal, but it's not exactly innovative either. However, the ASUS TUF Gaming K7 is different, very different in fact, and that's got me seriously hyped to test it out! Operating at the speed of light…ish, thanks to the new optical-mechanical switches, which are said to have an actuation that's 25x faster than mechanical switches. Now, I don't know if I'll be able to tell, but we shall see. Then we've got full IP56 dust and water resistance, foam padding wrist rest, RGB lighting, and on-the-fly controls. Overall, that's pretty well equipped, but it's those switches that have me the most excited. 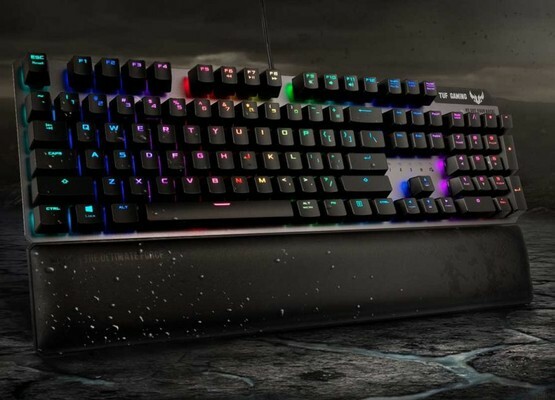 Asus TUF Gaming K7 Keyboard kaufen.